Hello lovelies! How are you all doing? I hope everything is going well with your life. The weather here in the UK has been depressing, rainy. And I can’t wait to go back to Portugal on the 7th of August! I am here today to share with you a new make up tutorial that I have uploaded on my YouTube Channel. It is a beautiful makeup look with a glitter eyeliner. Perfect if you want to get noticed on a night out or New Years as this will give you a beautiful sparkle. 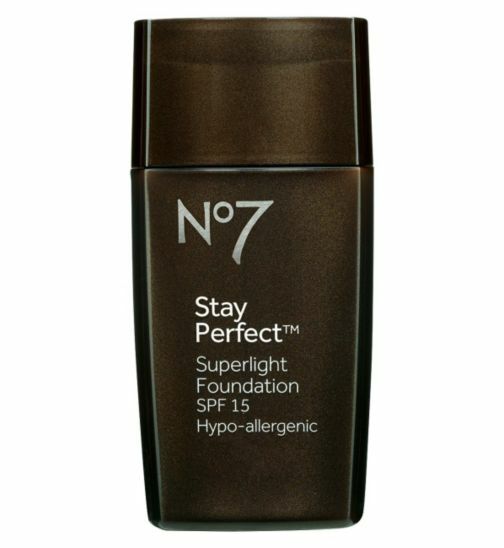 On this video I also did a very quick first impression on the No7 Stay Perfect Superlight Foundation but I decided that I should do an even more detailed kind of First Impression blog post. Basically, I went to Boots and the lovely lady asked if I wanted to find out which is my perfect foundation shade. Of course I said yes and with that she gave me a sample of that foundation. That was very nice of her as sometimes you can buy a foundation and not like it at all so she gave me the opportunity to try it at home and that is what you will also see in this video. They say that is a very light weigh foundation but that is give you a medium to full coverage and that is something that I look for in a foundation. It also states to be weather-proof and transfer-proof. In my opinion, this foundation is very light weight but it is not at all a medium to full coverage foundation. I would say that it is most likely light to medium. Not that I don’t like that fact but if you only wear full coverage foundation, this is not the one for you. If you like a perfect and natural look, this is perfect. You can barely feel anything on your skin but it still evens out your skin tone without covering all the little imperfections or details that make you look like yourself. I wore this foundation almost for 7 hours as I did the video in the morning and after, to test if it was weather-proof, I decided to do some cleaning. So I noticed that not even with sweat this foundation will fade. It stays in place but it does transfer. My white t-shirt turned brown on one side from when I removed it. If you have big pores, I would say that this foundation would should them so you should wear a good primer before applying the foundation. I have dry to normal skin and foundation stayed very well on my skin and gave me a very glowy finish. So maybe if you have oily skin you should powder this foundation very well too. In conclusion, I would say that this is not a perfect foundation for whom who wants a perfect and flawless finish and for it to last all day. But for those summer days that you can’t even deal with a very thick foundation but you still want to look good, this is a very good option. Anyways, for the price (£14.50) I would say that there is many other good ones for a lower price than that one at the drugstore and you don’t have to look to hard to find them. I hope you liked this review and video. Subscribe to my YouTube channel and blog so you don’t miss any new post.